Okay, so no Friday finish post for me last week as I had hoped, but a Sunday finish post is almost just as good, right? My latest quilt is all done, and I'm super excited about how it turned out. I really pondered over the quilting on this one, and with all of that negative space, I almost pulled the trigger on quilting different motifs, but in the end, I gave into my standby and did an allover tight stipple. 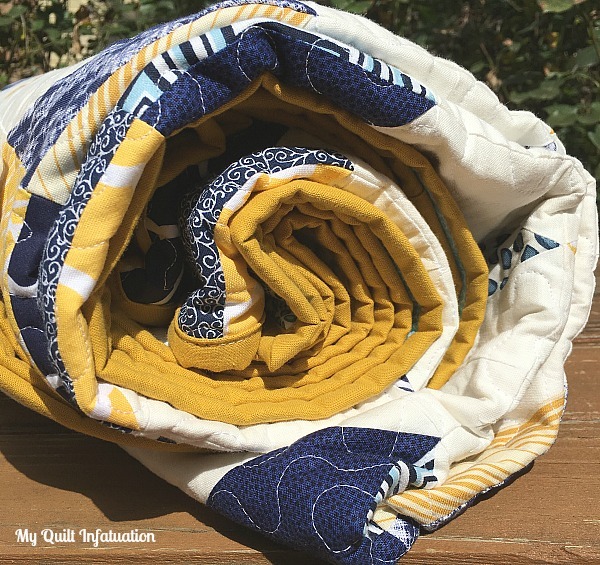 It isn't flashy, but it really is my very favorite for letting the design of the quilt really take center stage, and you know I'm all about embracing what I love! If you're familiar with my patterns, you know I love to incorporate designs that give the illusion of curves, that are actually created with all straight piecing, and this one definitely does that. As usual, all of my leftovers were put to good use on the back. It's hard for me to call them scraps because they are such large chunks. Most times when I purchase fabric, I buy at least a 1/2 yard, specifically so I can have a piece for the back. As luck would have it, the remnant bin at my local JoAnn had a 1 yard piece of Cloud 9 Cirrus solid in Amber, and it worked perfectly for the binding, with plenty leftover for another project. Score! The pattern for this quilt is already in the works, and I'll be sure to let you know when it is available. Beautiful, love the dense quilting! It's beautiful; I love all that negative space and the palette! 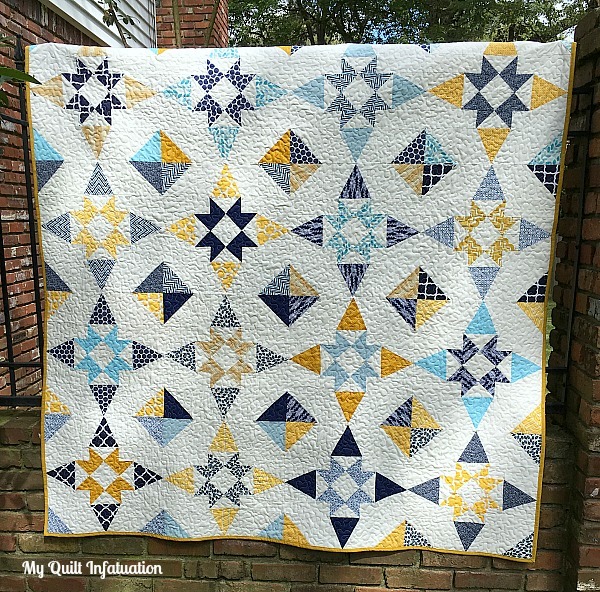 Gorgeous pattern and quilting. Love the optical illusion of curves. Love the colors and the all over flow of the design. very nice. Thanks for your inspiration and sharing. 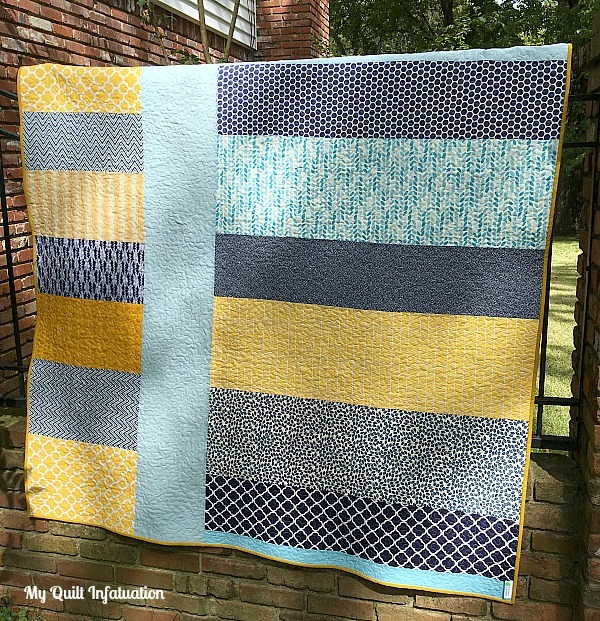 This is the first modern style quilt that has really caught my eye. Perhaps it is the piecing or it may be the colors but I really love this one. Thank you for all of your dedication to your blog and the beautiful inspiration to us all. very pretty and the quilting is great. I absolutely love this!!! Blue and yellow/gold looks so crisp and clean. Your quilting is delightful! The block is very unusual! I'm going to add that to the idea file . . . and the pieced back is grand. Great finish. Great design and those fabrics/colors seem to fit it perfectly. Well done! 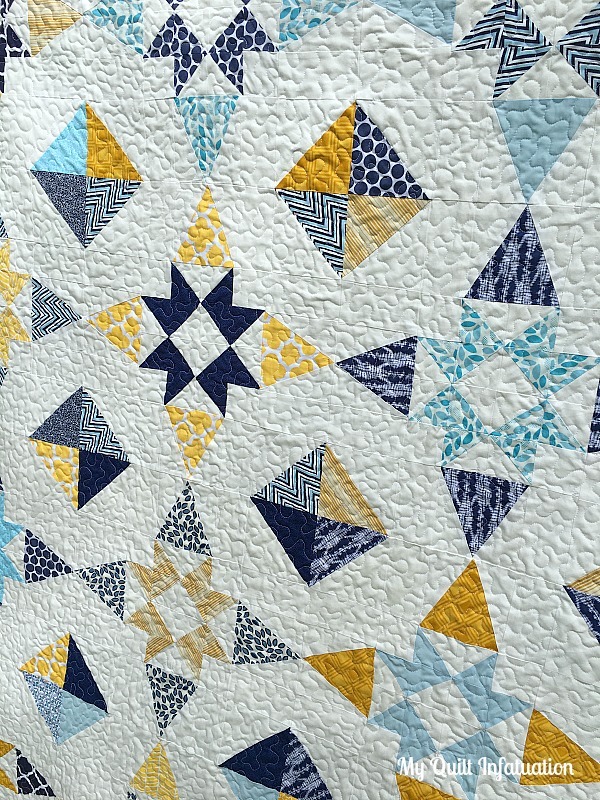 You picked the perfect quilting design for this quilt. I really like the blue and gold on white! Very nice design. Your fabrics are great, too. I love the effect of Tri-recs. Beautiful finish! The quilting is perfect, it really does make those stars shine. Fabulous quilt. 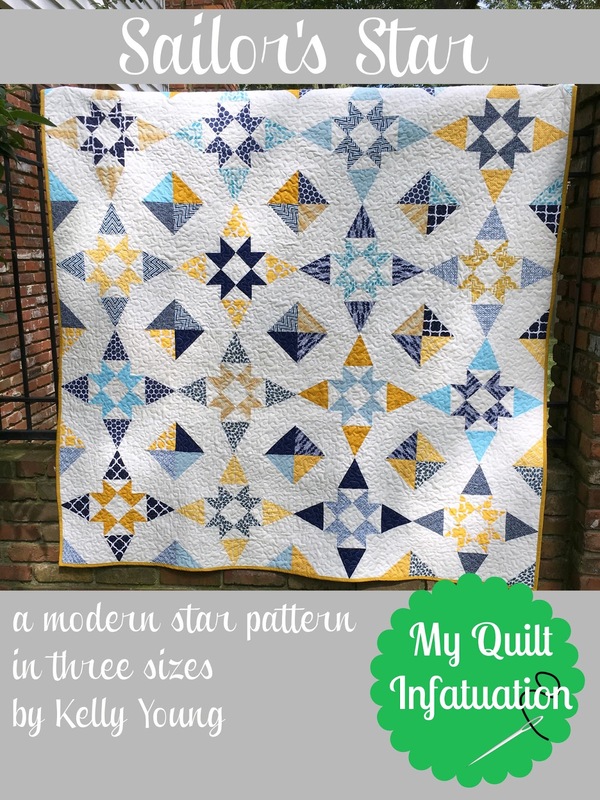 I love everything about it...the unusual star design, the mustard and navy color combination, the pieced back AND the quilting. Lovely finish. Beautiful design. I love it. I love how the stipple quilt design is beautiful and allows the pattern to shine. I really like everything about this quilt. The quilting, colors, and patterns all make up a stunning quilt. Fabulous pattern and quilting.Love your fabric combo.This quilt is an eye catching! Your stippling is wonderful. I have to say mine looks totally different and I really wished it looked more like yours. Sigh. Beautiful quilt/great quilting and yea! for a finish whatever day of the week! What a beautiful quilt Kelly and like you.....many times I just do a stipple quilt pattern, that is my standby.